SHE IS BATTLING WITH 3 BIG FIBROIDS SHE HAD DONE FIBROID SURGERY SOME YEAR AGO. 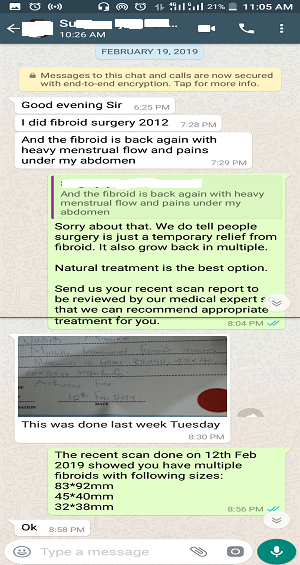 She did surgery in 2017, now the fibroids are back. 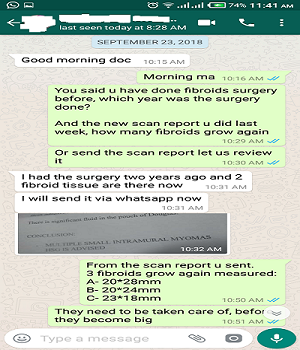 SHE IS STILL STRUGGLING WITH 3 FIBROIDS AFTER SHE HAD DONE FIBROID SURGERY 2 YEARS AGO. SHE HAS UNDERGONE SURGERY 2 TIMES, YET THE FIBROIDS ARE BACK MORE BIGGER & STRONGER THAN BEFORE. The truth is almost every woman that menstruates has one or more fibroids. Some fibroids are problematic while some are not. If you discovered you have fibroids seeking surgery to eliminate is risky although it is fast solution but very dangerous. They grow back even bigger and stronger. Most of our patients we have treated have done fibroid surgery before coming to us for treatment without surgery. 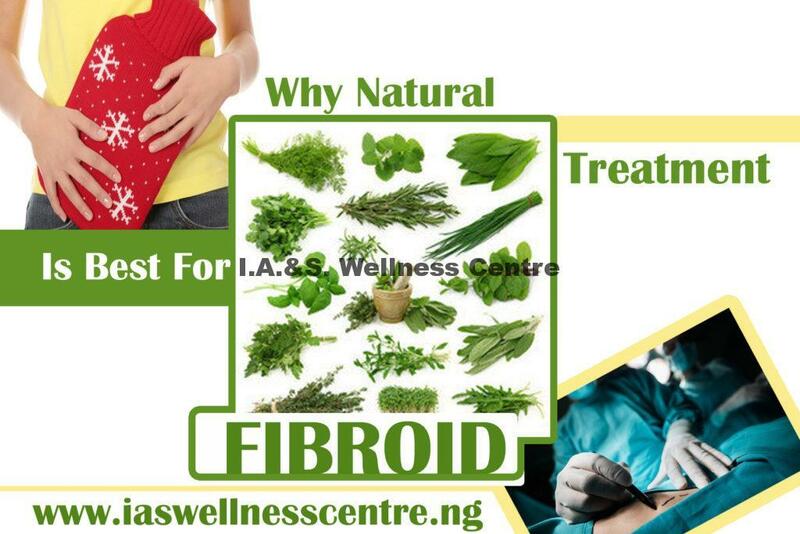 Natural solutions have proven to be the best option to permanently treat fibroids without recurrence or side effects often associated with surgery although it might take time depending on the size of the fibroids yet still the best. It has no complication, no risk and no side effect. YOU SHOULD STOP RISKING YOUR LIFE. YOU CAN GET RID OF FIBROID WITH OUR FIBROIDS SOLUTION KIT (FSK). Fibroids Solution Kit Is A Natural Cure For Fibroid Without Surgery. It Is Excellent Combination Of Body Cleansing Kit, Anti-Fibroid/Tumor, Estrogen And Hormonal Balancing Kit. The Kit Is A Fast Approach To Rapidly Shrink and Dissolve Small, Medium, Large And Extra-Large Fibroids With Severe Symptoms. It Provides Result You Can Feel In A Matter Of Weeks. Over years in practice, we have not seen anything works better than this herbal remedy in the fibroids solution kit. We are proud and confident about the treatment. This entry was posted in Health articles and tagged fibroid, surgery.